Your Holiday Feast | Kay Rice, M.Ed. Your Holiday Feast was the very first book I published. It was an experiment into Self Publishing from start to finish. Since the publishing of this book, I’ve gone on to contribute to other books and have assisted other authors with creating, publishing and marketing their books. When I began cooking and planning holiday dinners and reunions for my family I quickly realized how overwhelming the task could be for someone who had never done this before. Through the years I assembled a file of our favorite family recipes. I saved shopping lists, time lines and kept notes about what worked and what didn’t from year to year. Ten years into doing this I put together a notebook and handed out to other family members. My mission was to make certain if I ever stopped putting together these family holiday reunions everyone else in my family would have all the recipes, lists and tips I used each year. They would have the blueprint to put on their own Holiday Family Reunion. They loved it so much that they encouraged me to publish it. NOW, more than 15 years later and a considerable amount of nudging and prodding I have done just that. I hope that Your Holiday Feast will help many who are planning and preparing a Holiday Event for their family to make it fun delicious and memorable! Your Holiday Feast is a holiday cookbook & planning guide which is full of my family recipes and tips that I used for decades while hosting our annual Thanksgiving Family Reunion. Guests arrived early in the week and stayed until the weekend. It is so nice to have all of our family recipes in one place, and it has been fun to share. ELEGANT & EASY HOLIDAY ENTERTAINING Whether you are entertaining during the holiday for the first time or whether you are seasoned holiday host or hostess, Your Holiday Feast cookbook and planning guide was created for you. If you have never made a traditional Holiday Dinner, this book has all the information you will need in one place: –Traditional recipes & family favorites –Organizational tips –Suggestions for making things ahead of time –Shopping and planning lists –Tips for making everyone feel welcome and at home You will learn how easy it is to make your holiday entertaining stress free, elegant, and a time for everyone to look forward to and remember long after the event. Whether you are hosting a small gathering or a large crowd, you can consider Your Holiday Feast your holiday entertaining blueprint! You will find suggestions to make your holiday a time to enjoy family and food, and will create memories and traditions that will last for years to come. Have your guests raving about how delicious everything is and be amazed at how easy you make it look. It is all in the planning and preparation, and of course, the delicious recipes! 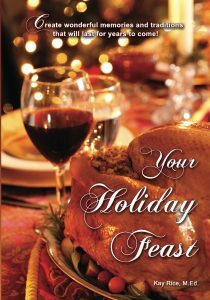 Your Holiday Feast, Cookbook & Planning Guide is available at Amazon.com—to order your copy, click on the image below.